The St. Paul's congregation has been working hard to make our church accessible to those with special needs. Over the last several years the congregation has been lucky to have a dedicated team of specialized individuals that have discovered many ways to change our aged building design to meet the needs of those that are mobility challenged. We welcome your suggestions in areas which we could further improve your worship experience. 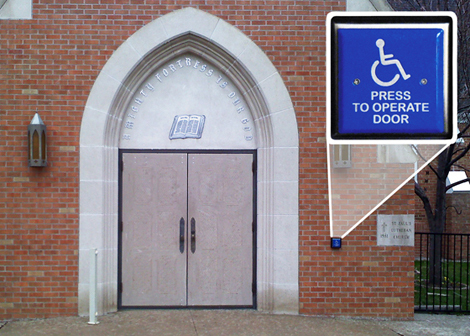 Automatic Opening Doors provide easy street level access to and from the main entrance of St. Paul’s Lutheran Church. This entry level will take you to the elevator which provides access to: Upper Level where the Sanctuary, Classrooms, and offices are located; Lower Level where the Fellowship Hall, Kitchen, and Handicap Accessible Restrooms are located. In the summer of 2013 wheelchair accessibility in the Sanctuary was handled by removing and re-spacing the pews. The pew re-spacing was from 6½”- 8 ½” to a minimum of 16” to a maximum of 24”. This new floor plan includes multiple wheelchair stations with pews for family seating immediately adjacent. Wheelchair access to the Altar allows all to participate in communion at the Altar. Just ask the Ushers for large print worship materials for use during services. 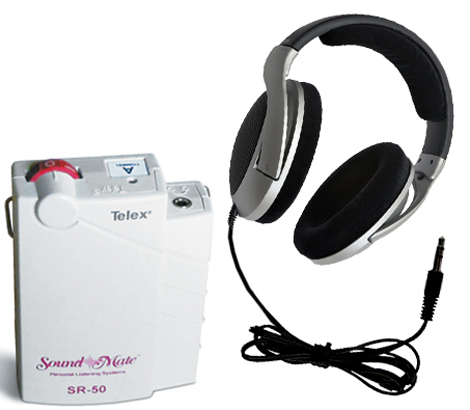 For those in need of hearing assistance St. Paul’s has available the Sound Mate SR-50 apparatus. This system is easy to use, and allows you the freedom to sit anywhere in the Sanctuary while wearing your personal headphones/ear buds. The SR-50 utilizes a standard 3.5mm stereo phone jack and provides an independent volume control. Ask an Usher to provide you with a unit and instructions. 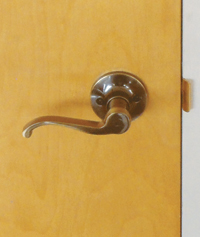 St. Paul's recently upgraded the old doorknobs to easy access lever handles. The downstairs restrooms were upgraded to family restrooms, with taller stools, exceptional room for wheelchairs and walkers and counter tops that allow wheelchairs to pull up to reach the sink. St. Paul’s has Handicap Parking available both in our parking lot and curbside on House Avenue. St. Paul’s has an elevator which provides access to both upper and lower levels. CD recordings of Sunday services are available by delivery to those interested. Additionally, a sacramental visit by a Pastor can also be arranged. If you wish to receive either of these services, or set them up for a friend or family member, please contact the church office. ©2015 St. Paul's Lutheran Church, Cheyenne WY. Site designed by Prairie Sage Creative.